You’re invited! Download your invitation to the biggest Holiday Party and Sale of the year, the evening of December 6 at both Rainbow Ag stores! Just bring in your invitation (one per family is fine) and be ready at 6:15 PM on Thursday December 6 to join Rainbow Ag for the perfect way to kick off the holiday season. Save 20% on everything in the store* and the first fifty in line get a free gift bag from Rainbow. There’s also the chance to win some great raffle prizes – receive a raffle ticket for every $25.00 spend, and then enter the tickets in the raffles you want! You don’t need to be present to win. Enjoy some tasty refreshments and fun, and take advantage of the great Hot Buys available only that evening. And, at Rainbow there is always FREE GIFT WRAPPING! Can’t make it in after-hours for the party? Just bring your invitation in anytime on Thursday December 6 to get 20% off your purchases. (Hot Buy specials are during the evening party ONLY). 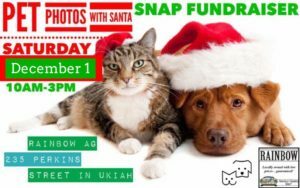 Today – December 1st – at the Ukiah Rainbow store – it’s SNAP’s Pet Photos with Santa! From 10 AM to 3 PM, bring in your whole family – two-legged, four-legged, no-legged or winged – and get a holiday keepsake photo with Jolly Old Santa Claus! For only a $20 donation, get either a disc or print photos. There will be other fun stuff in store too, so don’t miss it! 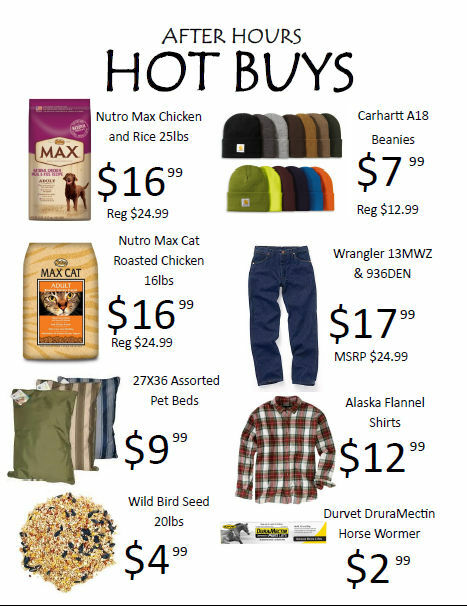 All proceeds benefit the Spay Neuter Assistance Program. Keep an eye on your inbox – Rainbow has weekly specials that are sure to please, on some of the best-selling items in our stores! Just watch for the Monday email with that week’s special deal, in your email inbox. We’ll keep you informed about sales, new items and special events in the stores so that you never miss a deal! The Holidays are a time to help those in need, and with the wildfire devastation in Northern California this year, help for those displaced by the fires and their pets, horses and livestock has never been more needed. Rainbow Ag collects donations for both large and small animal rescue and assistance groups, including SAFER (Sonoma Action For Equine Rescue), which provides feed and supplies to those in need. SAFER’s Donate a Bale program is as easy as asking the cashier to add a bale of hay to your tab at checkout! A bale at at time – we can do it! Learn more or donate at SAFER’s website, www.saferhorse.com. The weather is finally rainy and maybe even some snow in the forecast! 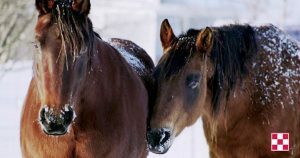 During cold weather, some horses need a little extra care, maybe a blanket or some extra feed. Horses need adequate hay in the winter, as the process of digestion is heat-producing and can help your horse maintain his temperature in the cold weather. Horses generally need at least 1% of their body weight per day in roughage, but in the winter 2% may be more appropriate, especially if the horse lives outdoors. Grain provides extra calories as needed too, and of course be sure that your horses have a supply of drinkable water available. If water is too cold, horses are likely to drink less and be more prone to impaction-induced colic. Get more tips on maintaining your horses during the colder weather in this article from Purina Senior Nutritionist, Katie Young Ph.D.
War Admiral did not fare well in starting gates. He hated the contraptions, and cut off a piece of his hoof struggling in the gate coming out of the Belmont Stakes, but was such a great horse, still managed to win the race. If Riddle was going to race his prize horse against Seabiscuit, he wanted it without a starting gate. They would use a bell to start the race, which gave the advantage to War Admiral. He was a speed horse – a fast starter — and the horse that got out front first in these match races often wound up winning. Seabiscuit liked to run with the pack and then take the lead. Remarkably, Smith would change Seabiscuit’s racing style – something very difficult to do to a horse at this stage of their racing career. Secretly, he set up an alarm clock to get Seabiscuit to take off at the sound of a bell, until Seabiscuit became fast right out of the break. Happy Holidays from all of us at Rainbow Ag! This entry was posted on Friday, November 30th, 2018 at 3:03 pm	and is filed under News, On The Right Lead Newsletter. You can follow any responses to this entry through the RSS 2.0 feed. Both comments and pings are currently closed.